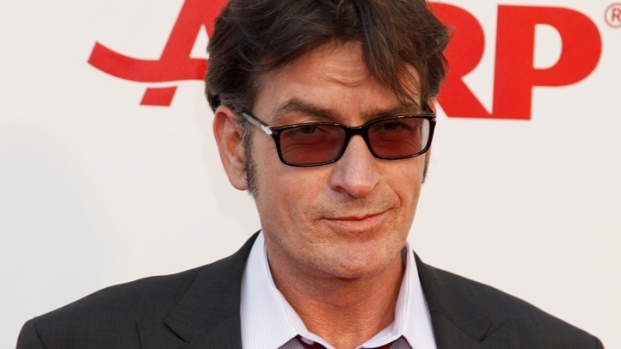 Charlie Sheen is seeking laughs at his own expense. For a moment in Charlie Sheen's new self-parody of his self-destructive "20-20" interview, there's a hint the actor realizes what a joke he's become. As he delivers goofy variations on his bizarre "tiger blood" and "Adonis DNA" catchphrases, you think that just maybe the “Two and a Half Men” castoff is finally in on the gag, offering some hope he might start to pull his life together. Then he stuffs a taco in his mouth while wearing an Elmo bib as he dodges a question about drug use. Sheen's video, a fast YouTube hit, is a wacky mess, filled with plugs for his T-Shirt line and non-sequiturs that include a semi-synchronized swimming scene, lit cigarettes stuffed in the actor’s nostrils and ears, and a cutaway to the machinegun scene from "Scarface." Judging from reports about Sheen's ongoing "Violent Torpedo of Truth" tour, the video appears coherent by comparison – at least it's free. Sheen, whose disturbing downfall is made more troubling by profit-seekers trying to benefiting from his ongoing public decline, is apparently desperate enough for attention to play along with the sad joke that is his life. The video was posted Sunday, just a couple days after another much-mocked entertainment figure – "Friday" singer Rebecca Black – released a series of self-parodying shorts on Funny or Die. Unlike Sheen's latest debacle, Black’s videos are actually funny – and show that a 13-year-old whose only sin was to produce an annoying pop confection has more self-awareness than a flailing 45-year-old washout. The videos include a clever "Behind the Music" parody and a short in which Black analyzes the deeper meaning of a song that's basically an inane ode to a carefree adolescence. “’Gotta have my bowl, got to have cereal’ – that line is about consumerism,” she says. The teen, who came out of nowhere to give us the most hated YouTube video ever, displays poise and credible comic timing in the Funny or Die pieces. More importantly, she takes control of her pillorying by effectively employing humor to show she's in on the joke. That's a far cry from Sheen, whose latest desperate, lame efforts to get laughs only show how out of control he still is.